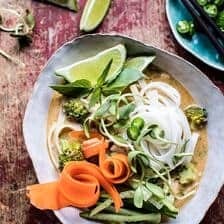 Saucy Coconut Curry with Rice Noodles and Garden Vegetables. Best summer curry EVER. 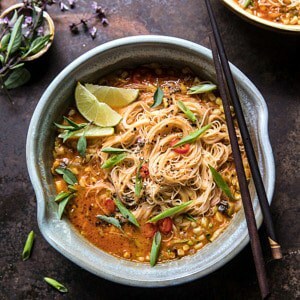 Make this curry with whatever you have on hand, I used a mix of sweet corn and zucchini, coconut milk, and rice noodles. Then add some heat with curry paste, and balance it all out with a squeeze of lime. Best part…all you need for this recipe are pantry ingredients and 30 minutes. Yes please! 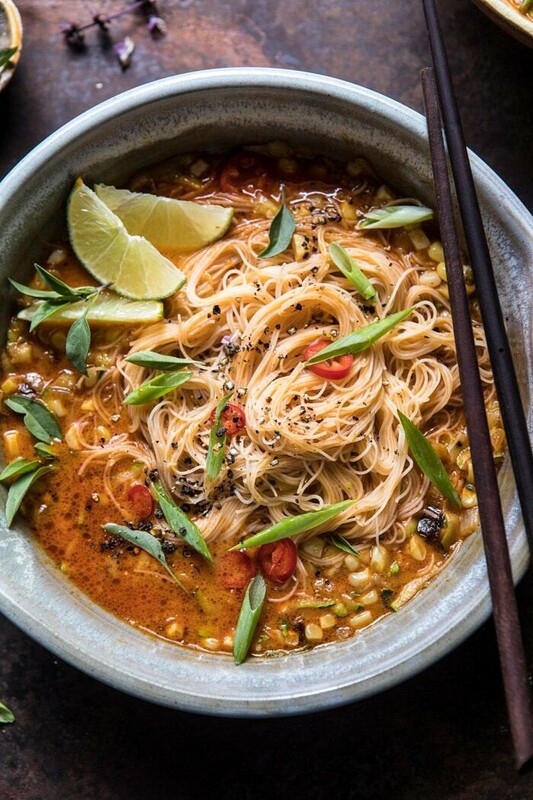 Noodles need to be extra saucy…they do. 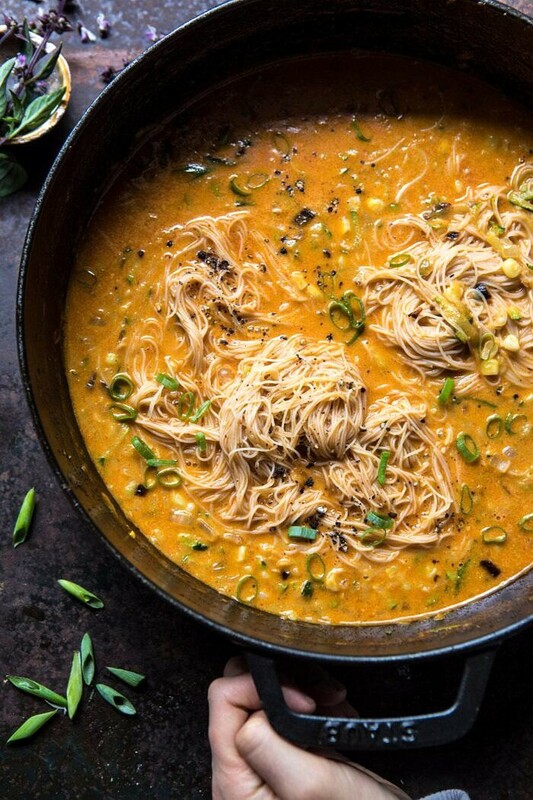 Especially noodles in a curry based sauce, because oh my gosh, so much flavor. Do you agree?! Please tell me you do because I am so excited to share today’s recipe with you guys. It’s become a GO-TO. It’s quick, easy, delicious, almost vegan, and also happens to be healthy. Cool. Cool. It’s been a while since I did a good curry, so I decided make a summer curry inspired by two things, the ingredients growing in gardens (or found at the market) and the ingredients hidden deep within my pantry. If you’ve been reading for any amount of time, you know I love two things, fresh vegetables and a well stocked pantry. So this recipe is right up my alley. Growing up, my mom always made a very serious effort to have the most well-stocked pantry around. She’d have back-ups for her back-ups and never run out of anything. It was impressive, and her well-stocked pantry rubbed off on me. I too try to keep my pantry loaded, and be sure to have back-ups for my back-ups. I’m not as good as she was, but I try. Side Note: my mom was very strict about never letting her chocolate chip stash go lower than four bags. When it hit four bags, she’d run to Sam’s Club to restock. The woman had her priorities in order guys. She is good! Anyway, I always find it nice to make a pantry recipe come Thursday or Friday when my groceries for the week are dwindling down and I don’t have a lot of fresh groceries to use up. It uses a mix of pantry staples, along with produce you may have growing in your garden or just on hand from a recent trip to the market. Either way, it’s easy, delicious, and something a little different from just another grilled corn and zucchini recipe. Start with your noodles. 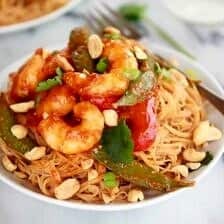 I love using the super thin vermicelli rice noodles, but any rice noodle or noodle that you have on hand will be great. Just be sure to find a noodle you love and something that will hold up well in a good amount of curry sauce. OK. So for the curry, you’ll need three key ingredients: veggies, curry paste, and coconut milk. For the veggies, you can use whatever you have on hand, bell peppers, eggplant, corn, zucchini, they all work, so use what you love or what you have. 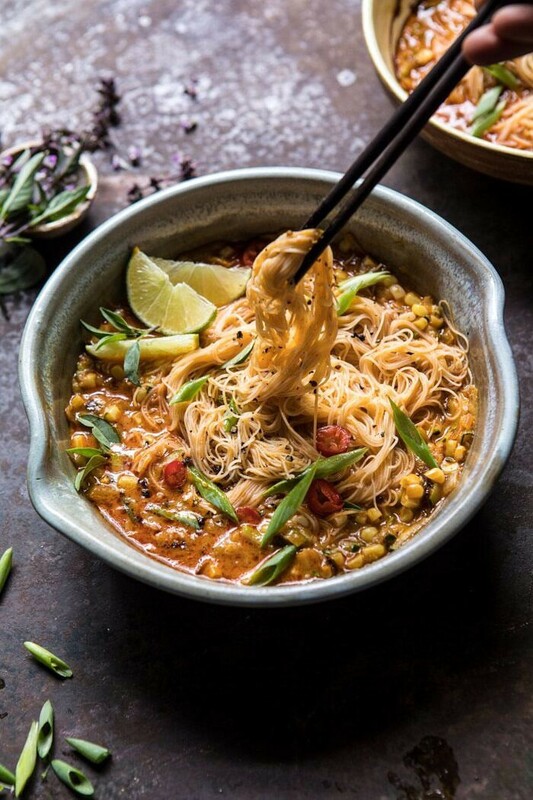 You’ll cook up the veggies, then add the curry paste, coconut milk, and a dash of fish sauce (omit if you’re vegan, if you’re not vegan, TRY IT, it’s the best – promise). Simmer everything for a minute or two and done. It’s really quick and easy, but also so incredibly flavorful. I love a spicy red Thai curry paste (my favorite is Thai Kitchen) and full fat canned coconut milk. 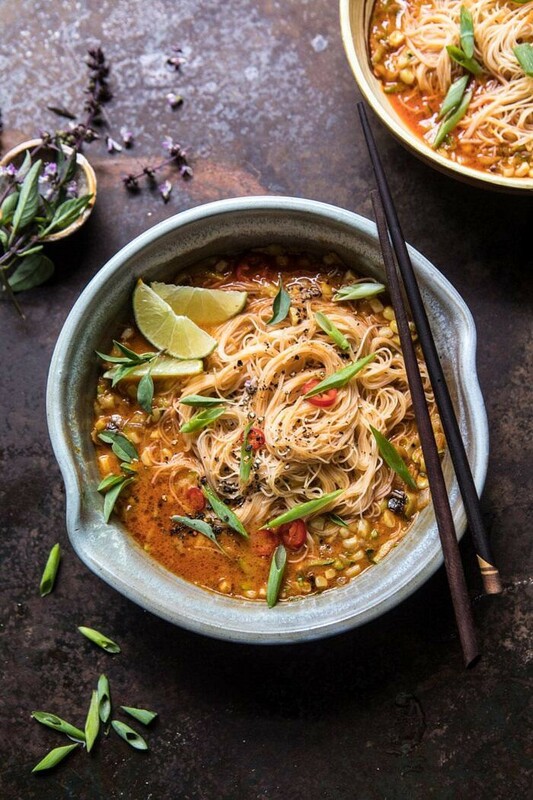 The curry paste and coconut milk are key to this recipe. They are the flavor and the creaminess to the curry, so don’t skimp on them! As soon as the curry is done, I spoon it overtop the noodles and EAT. It’s important to eat the curry as soon as you put it over the noodles or the noodles will soak up all that amazing sauce. Still good, but soggy noodles aren’t my favorite. So just keep the noodles separate until you’re ready to eat! Finish with some spicy chili peppers and green onions and done. Dinner in just about thirty minutes and made using pantry staples and fresh produce. Kind of love it. Hope you do too! 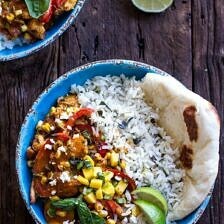 If you make this saucy coconut curry, please be sure to leave a comment and/or give this recipe a rating! I love hearing from you guys and always do my best to respond to each and every one of you. Oh, and of course, if you do make this curry, don’t forget to also tag me on Instagram so I can see! Looking through the photos of recipes you all have made is my favorite! 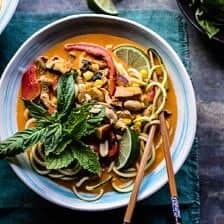 Make this curry with whatever you have on hand, I used a mix of sweet corn and zucchini, coconut milk, and rice noodles. Then add some heat with curry paste, and balance it all out with a squeeze of lime. Best part...all you need for this recipe are pantry ingredients and 30 minutes. 1. Cook rice noodles according to packaged directions. 2. Heat the coconut oil in a large skillet over high heat. Add the onion and cook 5 minutes or until fragrant. Add the zucchini, corn, garlic, and ginger. Cook the veggies another 5 minutes or until they just begin to soften. 3. Stir in the curry paste and cook until fragrant, about 1 minute. 4. Add the coconut milk, 1/3-1/2 cup water, fish sauce, and honey. Stir to combine, bring the mixture to a boil, cook 5 minutes or until the sauce thickens slightly. If the sauce thickens too much, add additional water to thin. Remove from the heat and stir in the lime juice and zest, cilantro, and basil. 5. To serve, divide the noodle among bowls and spoon the curry overtop. Top with peppers and green onions. Enjoy! 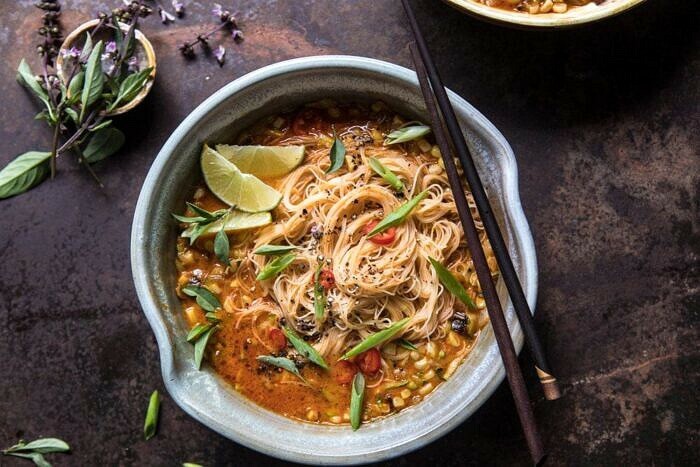 Coconut Lime Chicken Curry with Rice Noodles. I sooooo could eat this now! I hope you try this! Thank you Ruth! This is on the menu this week. Really enjoy your curry recipes. Why is the prep time so long? This dish is on the menu this. Really enjoy your curry recipes. Thank you Joyce! I am so glad you like this and hope it turns out amazing for you! p.s. i think your times are off in the prep time/cook time graph! I am so happy to hear that! I hope you absolutely love this curry recipe Amanda! So glad you do! I hope you love this recipe Rebecca! Well I hope you love this recipe if you get a chance to try it Sarah! Thank you! This was delicious, and a great way to use up the summer squash. Will definitely be adding this to the summer rotation! Thank you Jeff! I am so glad you loved this recipe! This is incredible. I love anything curry, especially if you put fish sauce in it. because fish sauce is just the most amazing condiment/ingredient. Such great flavor. Loving this recipe! Thank you so much Danielle! I am so glad you like this! Delicious!!! I made this tonight using what I had on hand I used carrots instead of corn and only had yellow onions. Such a great meatless and healthy meal. We have leftovers for tomorrow and I will surely be putting this into my dinner rotation. Thank you Marilyn! I am so glad you loved this recipe! This looks absolutely incredible. Please, PLEASE keep the curries coming. Thank you so much Betsy! I hope you try this! This was so good! Thanks for the great recipe! I added some shredded carrots because I had leftovers in my fridge. Perfect! I am so glad you enjoyed this Nicole! I made this couple days ago and it’s great. I took it over to a friend’s house and they loved it too. I put water in it as it was a little to thick added soy sauce and more fish sauce. Very good recipe. Thank you. I am so glad you and your friend loved this! Thank you!! We don’t care for squash of any kind, so what would you suggest? All I can come up with is sliced carrot and sliced chicken? since we do eat chicken. Hi there. I just made this recipe. I followed it exactly and it didn’t turn out as I thought it would. My curry broth was extremely creamy and thick, unlike your picture. I tried to water it down a bit but there was no fixing it. I see another comment with the same issue. I think this recipe would have worked better with broth or water. Might be worth looking into. This was a good veggie based meal, and good for the nut/soy/gluten free crew! I imagine it would also be good with some shrimp added (though it would no longer be vegan/veggie). Thanks for the recipe! I’ve been loving your blog! So good! I grilled the corn, onion and squash for extra smokiness, and served this over somen noodles, since that was what I had in the pantry. New favorite curry. I can’t wait to make this again, maybe with some grilled shrimp on top! Thank you for the wonderful recipe. I am so glad you enjoyed this Joanne! Thank you so much! This was absolutely AMAZING! Such great flavors and so simple. This will definitely be a regular on the meal prep list! My only question is about the sauce—someone else mentioned this as well—yours seemed much thinner and darker than mine. I was hoping it would be thin like that, but mine was a bit thicker. Thoughts on how to remedy?? Thanks again for a great recipe! Looks absolutely delicious and so beautiful. I also love the bowl you’re serving it in. I have an obsession with bowls, where did you find it? I made this last night and it was sooo delicious! You always come up with those super recipes! A dish to make again for sure. Thanks!! That is so sweet and amazing to hear! Thank you Denise! This looks amazing! Omg, I need to try it. I am so happy to hear that! Thank you Claire! Made this last night and it was awesome. The sauce didn’t turn out to be the same color as in the photo, but was still very tasty. I will add more paste next time. Great recipe! I am so glad you enjoyed this recipe Melissa! Thank you so much! Just made this with king prawns, red peppers and mushrooms!! Was soooo good. Thank you for your delicious recipes 🙂 Got me back into cooking! I am so glad you enjoyed this Sarah! Thank you! Wondering if that is why it thickened up so much? I did add 1/2 cup water but didn’t want to add too much more so as the sauce may lose flavor. It was very thick! I will definitely make this again but maybe try it in a pan and also put it over rice instead. The rice noodles seemed straw-like. I did soak them much longer than the package directions suggested but they just didn’t turn out right for some reason. Definitely making again with a few adjustments! This was so simple and a perfect weeknight meal! Heya! Super excited to try this recipe. Is it not a good recipe to freeze I’m guessing because of the thing about the noodles? If I want some of it for leftovers, should I keep the sauce separate from the noodles until the next day when I am ready to eat? Thanks for the advice! Made it tonight and it was the best curry I have ever made! THanks for the keeper, and versatile to boot! This recipe has become another of my go-to’s!!! I did goof on the last rendition and used cellophane noodles instead and am here to say that rice vermicelli is much, much better!!! Love the flavors and the corn is perfect in it. I am so happy to hear that Betty! Thank you so much! This was super easy to make and sooooo delicious! I added some celery and a sweet pepper to bulk up the veggie portions. I used just 2 Tbsp of the curry paste and my husband, who is not big on spice, loved it. I added siracha to my dish to add more of a kick that I prefer. Definitely a repeat meal for us since it is very simple to make for a very satisfying dish! That is so amazing! Thank you so much Andrea! Wow that is so amazing! Thank you so much Sarah-Jane! Thank you so much Raini! I am so glad you loved this and it turned out amazing! It was a chilly evening and I decided to try this recipe———SO glad I did. It was absolutely delicious. Totally agree about the fish sauce (I get it now!)….. going back for seconds 😉 Loved following this recipe! Thank you! Try it folks! Hi!!! This looks and sounds delish except for Zucchini and the Squash part. I don’t like those. What is a good substitute? First let me say my family of 6 are extreme foodies. They refuse to eat anything mediocre. I always make the dish as written then add my own twist. This dish is absolutely delicious as is and my crew has requested this become a regular on our menu. Love the sweetness from the fresh summer corn mixed with the spiciness from the jalapeno. Just wonderful. Great job! I am so happy to hear that! Thank you so much Yetta! Do you think this could be done in a slow cooker? This curry is delicious! Per your recommendations I added broccoli and bell peppers and the flavor was spot on. Thank you for another tasty dinner. Thank you Agne! I am so glad this recipe turned out amazing for you! This was so good! I didn’t have any corn on hand so I added in carrots instead. So yummy — will definitely be making again. I am so happy to hear that Sarah! Thank you! Hey! Was really good but I always fail to do the sauce perfectly.. I respect the dose (coconut milk and 1/2 cup of water) but the sauce comes out watery and really orange,.. But in the same time I’d does look creamy… And I don’t know sometimes when we cook it too long, it s not that good too for the coconut milk, and the oil doesn’t come at the surface . So don’t really know what to do. Hey! Was really good but I always fail to do the sauce perfectly.. I respect the dose (coconut milk and 1/2 cup of water) but the sauce comes out watery and really orange,.. But in the same time it does look creamy…, and the oil doesn’t come at the surface And I don’t know sometimes when we cook it too long, it s not that good too for the coconut milk . So don’t really know what to do, do u have any idea? I am sure it would be amazing! I hope you try this Martine! Made this tonight and my husband LOVED it!!! He even said he thought it might be his favorite thing i have ever made! Thank you for the recipe! Thank you so much Tarah! I am so glad you and your husband loved this recipe! I’m glad I discovered this recipe because it delivers at least as much flavor as another recipe that I’ve been using, while at the same time being much more simple and less expensive. 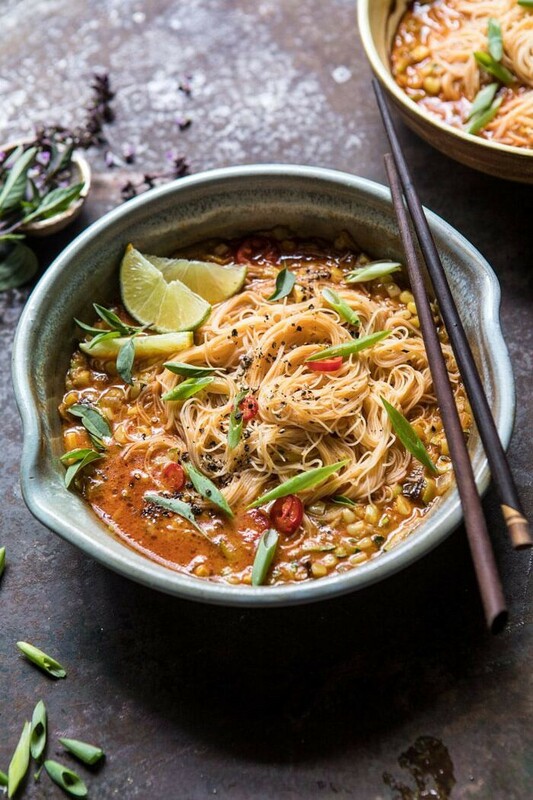 Rice noodles are common, inexpensive, quick to cook, and absorbs flavor really well. I used jarred jalapenos in brine and their tanginess and heat, surprisingly, matches really well with the dish. Hi! I am so glad you discovered this recipe as well! Thank you so much! I’ve tried probably 15-20 recipes from HBH, and this has been my first miss! I was able to salvage it with a decent amount of additional chicken broth, but the zucchini/corn didn’t seem to pair well with the dish. I imagine it would be much better with different vegetables. This just didn’t work for me. Seemed a bit like a kitchen dump. Which is fine if that’s indeed what it was, but I wouldn’t go out of my way to put these ingredients together. Hi Seraphina, I am so sorry you did not enjoy this recipe. Are there any questions I could help you out with? I hope you love some other recipes of mine!! This recipe was delicious! Added extra veggies and chicken- a great and filling meal! I am so happy to hear that! I hope you love all of the recipes you try, Marie! Thank you! I made this for dinner last night and just got so excited to eat it again today as leftovers for lunch! Absolutely delicious, I added corn, zucchini, onion, red/orange bell pepper and the flavors were amazing! Thank you! With 2TB curry paste, my anti-curry, 5-year-old actually ate this. Just delicious and a bonus that it was kid-friendly in my case. Thank you!